CHELSEA CHRONICLES - volume two - free on Amazon Kindle until May 7th HURRY UP! 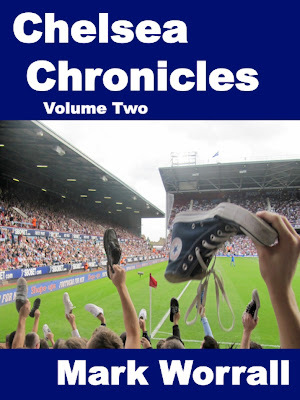 Chelsea Chronicles – volume two - is the second in the series of ‘best of’ anthologies by Blues author Mark Worrall and comprises of articles written specifically for the legendary cfcuk fanzine. Highly decorated Italian manager Carlo Ancelotti has taken over at Stamford Bridge and once again supporters hopes are raised, though as with all things Chelsea, no-one is quite sure what exactly is going to happen, and winning the Double isn't on anyone’s agenda. Surprise, surprise then when it happens and Chelsea Chronicles - volume two – outlines how True Blue life maps out for the fans from a supporters perspective. Remember Florent Malouda’s Inflatable Army? How about spanking Arsenal 3-0 at the Emirates? There's a tribute to Robert Fleck, a homage to Ken Bates and a premonition of the fallout of Ray Wilkins sacking interspersed with some great photos and accounts of European travels to Nicosia, Madrid, Milan and plenty more besides which all get that 'Over Land and Sea' treatment. Chelsea Chronicles – volume two – concludes with the inevitable sacking of Ancelotti and a tribute to the greatly missed Matthew Harding.